Bucket List Alert! Peru is at the top of your bucket list (and everyone else's), but the idea of capturing the best of this South American gem is really want catches your eye. 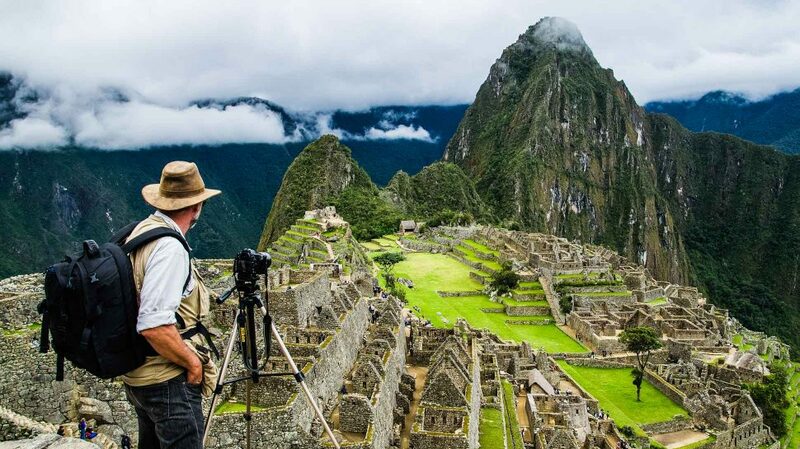 Our Peru photography tour offers a sensory immersion into three of the most stunning and culturally intriguing destinations in South America—Cusco, the Imperial City of the Incas, the pristine and awe-inspiring landscapes and villages of the Sacred Valley and finally the majestic Machu Picchu, one of the most coveted and beloved places in the world. For lovers of landscapes, colorful cultures and extraordinary culinary experiences, this tour has it all! Despite its touristic popularity, Peru retains a mystical quality that is so rarely found in our modern world. The remnants of the ancient Inca culture can be seen in the beautiful faces of the indigenous people and heard in the Quechua language that is still widely spoken. The symbolism found on their pottery and exquisite weaving speaks a beautiful language all its own. Long before the Europeans arrived here, the Incas had established a great civilization in the Sacred Valley. We will experience many facets of this fascinating ancient world—the ancient ruins of Pisac, Ollantaytambo, Moray and Machu Picchu and the many traditions of the Incas hard-working descendants. We will stay in delightful accommodations close to the key archeology sites and villages in order to photograph in the best early morning and late afternoon light. By experiencing the pueblos on market days you will enjoy an abundance of photo opportunities of the modern day Inca and their traditions. A daily gastronomic exploration of the best Peruvian specialties such as: cuy, ceviche, choclo con queso, humitas, Pachamanca, Lomo and so many more! Your international flight arrives in the evening so we’ll stay at airport hotel to get a good night’s sleep and be ready for tomorrow morning’s departure to Cusco. We have an dinner orientation meeting to learn about the exciting days ahead and to answer all of your questions. The Wyndham Costa del Sol is the premier upscale international hotel in Lima. It’s very close to the airport to welcome you to your Peruvian adventure. We’ll catch our early morning flight to the beautiful city of Cusco. We start with a fabulous foodie tour to the market and around the city to sample and photograph the textures, and colors of the myriad of local specialties. After lunch we’ll go on a tour of this colonial gem, strolling through the Plaza de Armas and along Cusco’s charming stone streets. We’ll see first-hand many of the walls built by the Incas which now form the foundations of colonial buildings built by the Spaniards. We’ll catch the last golden light on the Cathedral and other buildings in the Plaza de Armas. A delicious dinner of local specialties awaits. The hotel is located in the San Blas neighborhood of Cusco, one of Cusco’s oldest but is now known as the bohemian neighborhood. The house has been renovated into a boutique hotel with modern amenities. Today, we have the whole day in and around Cusco. In the morning we’ll go on a walking tour with our guide visiting Koricancha, which was the center of the Incan Empire. We’ll continue to the charming artisan community of San Blas, before returning to the Plaza de Armas. After some free time after lunch we’ll visit the impressive Inca ruins site of Sacsayhuaman to capture the last light as it plays on the ancient Inca stones. On our way back down to Cuzco, we’ll stop to take photos of the city as the lights twinkle at twilight. At dinner we’ll sample a variety of Peruvian cuisine and watch a traditional music and dancing demonstration. A final night is spent in Cusco. In the early morning we leave Cusco and head to Pisac, taking the scenic back-road to the mountain community of Amaru. We are greeted with a warm welcome by the Amaru weavers who have formed the Laraypas Indígenas de Amaru weaving cooperative. 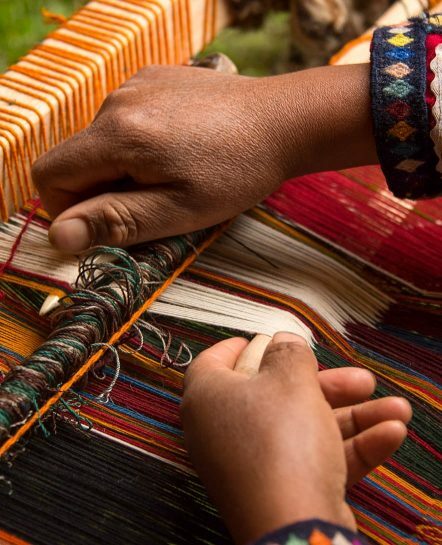 We learn about their weaving traditions and hear of the efforts to keep traditional ways thriving. We then we go into the fields to learn about their ancestral agricultural traditions. You’ll try some daily farming tasks and weaving techniques that have changed little in millennia. Sonesta Posadas del Inca is located in the town of Yucay on the Urubamba River. Built as a monastery in the 18th century, the property has since been renovated to contemporary standards. A beautiful garden surrounds the hotel and is there to greet you upon arrival. We have an early morning visit to Chinchero, home to one the best Andean textile markets. This is the perfect location to enjoy the morning light casting its glow on the picturesque churches, narrow streets and the ancient Inca walls. We’ll photograph the smiling market women wearing their colorful traditional dress. After we drive to Lake Piuray and enjoy a photo walk along its peaceful shores before a traditional picnic at the Piuray Outdoor Center. Here a pachamanca meal, cooked the ancient Inca way with hot stones, will be waiting. As well as enjoying the fabulous flavors of slow-baked lamb, chicken, potatoes, and green lima beans, you’ll learn how to recreate a pachamanca at home. In the early morning we’ll explore the Inca ruins at Ollantaytambo. From the ruins, we have a view of the village of Ollantaytambo, as well as the Urubamba Valley, with the snow-capped Andes rising in the background. We’ll explore Ollantaytambo which is the best surviving example of Inca city planning with narrow cobblestone streets that have been constantly inhabited since the 13th century. The traditional villagers still utilize the Inca-built irrigation canals that run through the town. After lunch we drive to visit the archaeological site of Moray and the village of Maras and finally Salinas, where thousands of salt pans have been used for salt extraction since Inca times. We’ll capture the stunning views of the valley at sunset and practice some night photography after a tasty pisco sour and more savory Peruvian specialties. Today is one you’ll never forget! We take the luxurious Machu Picchu train to kilometer 104 to hike the last section of the famous Inca Trail to Machu Picchu. This spectacular trail passes through several types of Andean environments including cloud forests and alpine tundra. Settlements, tunnels, and many Incan ruins are located along the trail before ending at the Sun Gate. From here, the curtain rises for the star of our show—the iconic and timeless Machu Picchu. By late afternoon the crowds have gone home and we can fully enjoy and photograph the play of golden light on one of the earth’s finest masterpieces. After a full day of sensory delights, we completely relax at the four-star Inka Terra Hotel nestled in a lush cloud forest. The Inkaterra Machu Picchu Pueblo Hotel consists of 81 adobe casitas in the Andean cloud forest. It’s one of National Geographic’s Unique Lodges of the world. The 12 acre property features 214 bird species and 372 orchid species, the world’s largest native orchid collection. We’ll rise early to see the amazing sight of sunrise over Machu Picchu, revealing a jagged landscape bathed in bright sunlight and cloaked in deep shadows. There will be the option of a hike to the Huayna Picchu offering superb shots of Machu Picchu in its mountainous surroundings. In the afternoon, back at Inka Terra you choose between the spa or a walk in the jungle to pick leaves and make tea from their tea garden, observe orchids and learn about their fascinating Spectacle Bear reentry project. Early rise to photograph the unique birds that are native to Inka Terra or just rest and relax in the spa before taking the mid-morning train then drive to Cusco. You have plenty of free time in Cusco to wander the ancient streets, photograph, shop and relax. We'll also have some time for image sharing before dinner. Tonight we have our final celebration at a traditional restaurant! Adios y buen viaje! We will take you on the last leg of your Panoramic Peru experience from the hotel to Cusco Airport for your fight back to Lima—You may opt for our extension in Lima or our three-day photo excursion to Puno and Lago Titicaca. In the morning we’ll depart for the beautiful drive to Lake Titicaca from Cuzco, making several stops along the way.. We’ll visit Andahuaylillas, a village with one of the most beautiful churches in the Andes. Continuing on the drive we’ll make other stops where we’ll have the opportunity to photograph pre-Inca and Inca sites. llamas and alpacas, and the incredible vistas of the Altiplano with the peaks of the Andes towering in the background. We’ll arrive at our hotel in Puno at the end of the day. Overnight La Hacienda Puno. We’ll spend the whole day visiting the islands on Lake Titicaca. Lake Titicaca is a beautiful and much-venerated sacred lake that lies on the border between Peru and Bolivia, near Copacabana. According to Incan mythology, it was from Lake Titicaca that the creator god Viracoca rose up to create the sun, moon, stars, and first human beings. Recently, a large temple was discovered submerged in the lake, adding to its mystery and fascination. Adios y buen viaje! We’ll have a relaxing morning at our lakefront hotel before being transported to the airport in Juliaca for our flight to Lima. We’ll arrive in the afternoon and have the option for a day-use hotel room before catching your international flights out that night.